The Phoebe Hearst Museum is pleased to welcome Dr. Kevin Gibbs to its research staff. 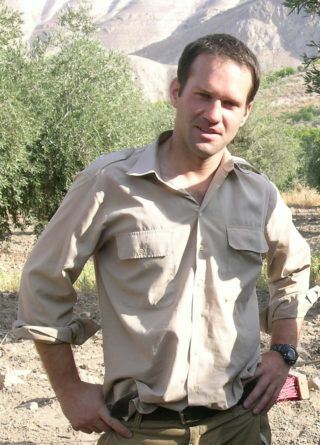 Dr. Gibbs is an archaeologist with interests in Eurasian and African prehistory. He completed his PhD in the Department of Anthropology at the University of Toronto. Prior to coming to the Hearst Museum he taught in Berkeley’s Anthropology Department and at the University of Nevada, Las Vegas. Previously, Kevin held postdoctoral fellowships at the University of Aberdeen in Scotland, where he investigated the origins of pottery in Japan and the Russian Far East. He also held a postdoctoral fellowship at the University of Manchester where he continued his excavations at a Late Neolithic and Early Bronze Age site in northern Jordan. He has a co-edited volume on hunter-gatherer pottery from northern environments that will appear soon from Cambridge University Press. At the Hearst, Kevin will examine collections from Holocene sites in Africa, the Near East and Japan, and will continue to analyze material from his excavations in Jordan.